Check out these cool new Chicago breweries that opened their doors in 2017. Chicago’s exciting craft beer scene just keeps expanding, with more than 60 breweries at last count. And you’ll find them all over the city, from the hot Fulton Market District to hip neighborhood pockets like Pilsen. Here we’ve spotlighted six new Chicago breweries that have opened in 2017. 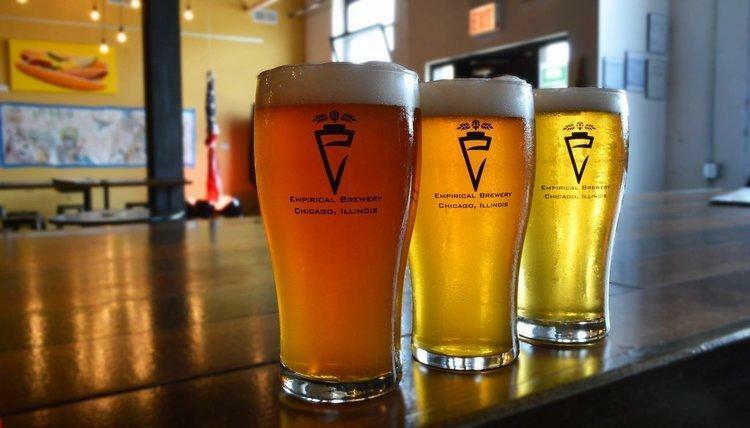 Make plans to visit these and more by following our 6 Chicago Neighborhood Craft Beer Trails. Settle into a red leather couch or belly up to the polished wood bar at this industrial-chic West Town brewery run by two Illinois natives. 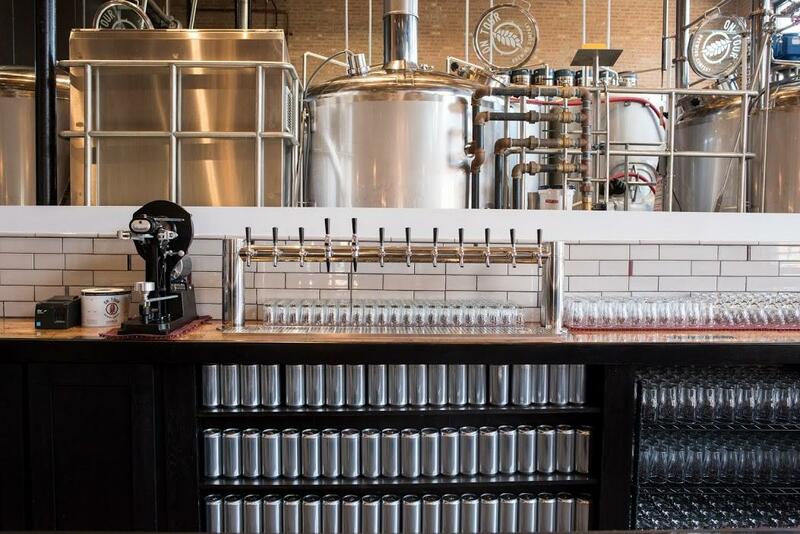 Stainless steel brewing tanks and wood barrels behind glass are the centerpiece of the soaring 75-seat tasting room housed in a former boiler factory. Try the Lightning Will, a classic German-style pilsner that was the first beer ever brewed by On Tour. Or order Chasing the Moonlight, a chocolate porter inspired by Mexican hot chocolate that’s brewed with Belgian dark semi-sweet chocolate, liquid cocoa and cinnamon. Make a reservation to join a brewery tour, held at 1pm on the first and third Saturday of every month, to sample three pours (and keep the souvenir On Tour glass!). The new Empirical Brew Pub, located within the restored Mayne Stage theater in Rogers Park, is the second location for Empirical Brewery (which has a taproom in Ravenswood). You’ll find Empirical’s flagship beers here, including its Infinity IPA, along with beer cocktails such as the Beergarita: Cold Fusion Cream Ale, tequila and house-made lime cordial. Order a dish from the beer-focused menu, such as the fish and chips coated in a batter infused with Heliotropic Pale Ale, or the corned beef sandwich slathered with Infinity IPA beer mustard. For dessert, try the boozy milkshake spiked with Phase Transition Robust Porter and crowned with beer-flavored whipped cream. Plans are currently underway for construction of the adjacent Empirical Labs, where the brewery will experiment with new recipes and produce beers on site. The newest microbrewery to open in Pilsen is Lo Rez, formed by Kevin Lilly and Dave Dahl, two former techies who started out as home brewers. Beer names are reflective of the owners’ former careers, such as the Belgian-style Daemon golden ale and Memory Fault, a Scottish-style strong ale. The taproom was a labor of love, with the founders rehabbing most of the 19th century building’s industrial space themselves. Picnic tables encourage mingling in the brick-walled taproom that features a 40-foot-long bar made of red oak. There’s no food menu, but guests can bring in their own take-out from local restaurants. On Sundays, brunch is provided by Hearth & Market food truck, specializing in wood-fired pizza made with farm-fresh ingredients. Adding to the Pilsen neighborhood’s roster of breweries is Alulu Brewpub, helmed by head brewer Frank Costanzo, a Chicago firefighter. Alulu’s small batch craft beers (20 on tap) are produced in its second-floor brewery. Try the Ghostly Liso, a Mexican lager, or the brown ale Crystal Keep. Or sample a “beertail” like the Alulu Michelada, shaken with lime, spicy vinaigrette and Ghostly Liso. Pair your beer with a selection from the global seasonal menu, such as the black bean burger with smoked jalapeños and poblano cream cheese. Casual reclaimed wood tables and a windowed garage door that opens up to the street in warm weather make Alulu Brewpub a cozy place you’ll want to hang out in and watch the hipsters go by. 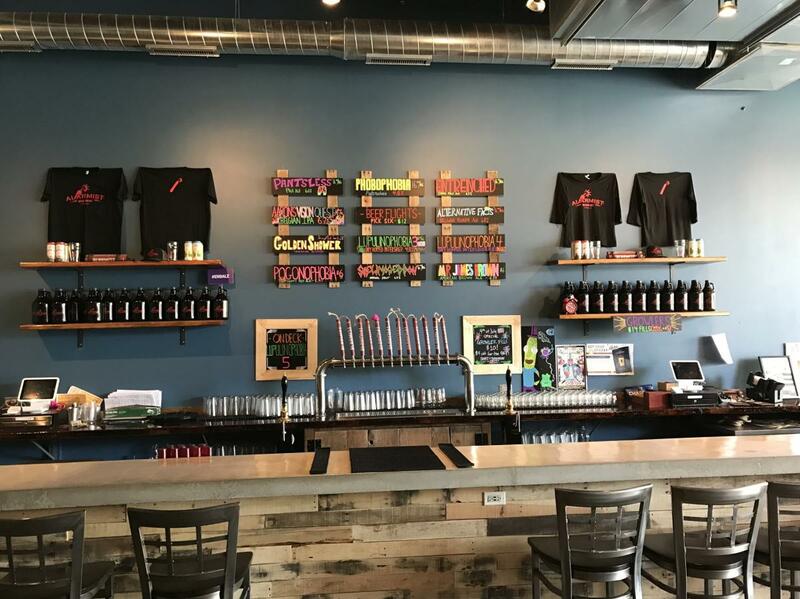 Alarmist Brewing opened its new taproom on Chicago’s far Northwest Side in the Sauganash neighborhood. The creation of the taproom was a family affair, with owner Gary Gulley and his son crafting the beer tap handles that look like sticks of dynamite. No TVs were installed in the taproom, as part of Gulley’s aim to provide a community space filled with lively conservation. All of Alarmist’s flagship beers are available, including the Illinois-style Entrenched IPA and Phobophobia Patersbier, a Belgian ale. But also look for taproom exclusives when you visit. Alarmist is family-friendly, welcoming kids (who are treated to free Goldfish crackers and juice boxes!) and dogs on leashes. Food can be ordered in from area eateries. Taste some of the best craft beers from Chicago and beyond at Grand Central’s new taproom, located in the West Loop’s hot Fulton Market District. This contract brewery, which helps brewery clients with their production, also turns out its own small batch beers. Take a seat at one of the wooden tables in the 200-seat taproom and select craft beers from 24 different taps. Local favorites include the Free Bird American pale ale from Begyle Brewing Company and Maplewood’s award-winning Charlatan APA. Great Central’s own offerings (available on draft and in cans) include a German-style helles lager and citrusy hefeweizen. But don’t expect any tastings or flights. Great Central believes you need to commit to at least a half pint of beer in order to fully experience it.